In several posts like Improving The East London Line, An Opportunity For Dalston, Platforms 11 And 12 At Stratford and Missing Links On The Overground, I mention the Dalston Eastern Curve. Currently, the land is occupied by a community garden called unsurprisingly the Dalston Eastern Curve Garden. The Google Map shows the area. The line of the Dalston Eastern Curve is clearly shown, as it leaves the North London Line that goes across the map, and curves its way down to Dalston Junction station on Dalston Lane. The garden occupies the Southernmost section and has an entrance on the Lane. These pictures show the area of the Curve. If it were to be reinstated the big losers would be the car park of the Shopping Centre and the Garden. A new reinstated Dalston Eastern rail curve would probably be covered, as is much of the Western Curve. After all, railway lines in tunnels or covered over can be used as building land for houses, offices, shopping centres or gardens. The rebuilding plans for Dalston Shopping Centre,shown many months ago, showed an open-aired concept, rather than the dated layout it has today. 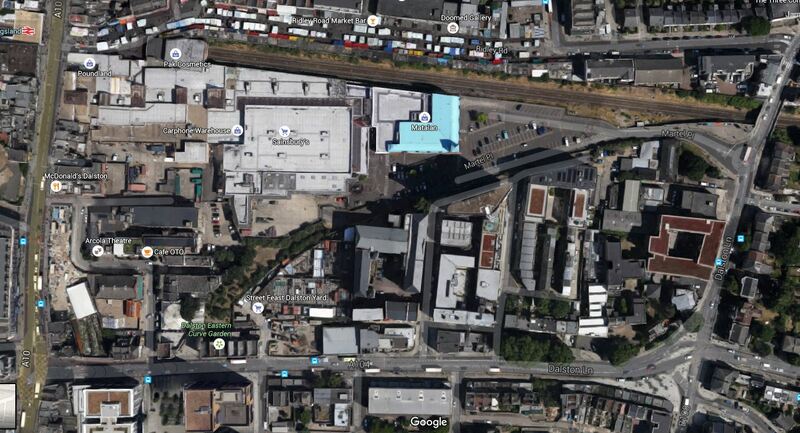 It also appears that the landlord of the Dalston Eastern Curve Garden is the owner of the Shopping Centre. So I suppose that what Transport for London and the Shopping Centre agree is needed, will be implemented. Other trends and facts must also be taken into account. The walking route between the two Dalston stations is terrible. Car parking is increasingly non-profitable for Shopping Centres to provide. More people will use bicycles and public transport to get to Dalston. Four extra trains an hour, are already planned on the East London Line. The East London Line has a capacity of twenty-four trains an hour. TfL has stated these could be six cars after some platform extensions. The East London Line will be given better connectivity to South East London, possibly by extending from New Cross or creating interchanges at Brockley and Penge. The North London Line could have more passenger trains. Especially, if freight trains on the line can be reduced. Waltham Forest Council has ambitions to have trains from Walthamstow Central and Chingford to Stratford by a reinstated Hall Farm Curve. Crossrail 2 or not, there will be massive developments up the Lea Valley, including housing and the Walthamstow Wetlands. Crossrail will connect to the East London Line at Whitechapel. What effects will this have on Dalston? Joining services back-to-back is always a good idea, as Thameslink showed years ago. It reduces the number of trains, staff and platforms needed to provide the service. And then there is Crossrail 2, which once it is defined and started, will change everybody’s plans for Central Dalston. I believe that the Dalston Eastern Curve will eventually be reinstated. The main reason will be the need to have more Northern destinations for all of those trains going up and down the East London Line. A reinstated curve will allow services to go to and from Stratford and possibly if the Hall Farm curve was also to be reinstated as far as Walthamstow and Chingford. So a series of short routes are converted into one long one, from Stratford or Chingford to say West Croydon, Orpington, Ebbsfleet or wherever! It should be noted that at present Chingford/Walthamstow to South London is a difficult crowded journey on the Victoria Line to get a train going south from either St. Pancras or Victoria. A reinstated Hall Farm Curve would make things better by giving access at Stratford to the Jubilee Line and Crossrail in 2019. Savvy passengers going from Stratford to South London destinations, change at Canonbury. But they would probably prefer a direct train via the Dalston Eastern Curve. One thing that will happen, is that when the Shopping Centre is rebuilt, then space will be left to reinstate the Dalston Eastern Curve.